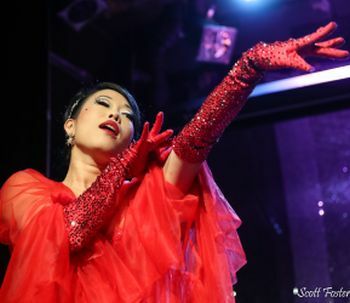 The Shanghai Pearl is an internationally renowned Burlesque performer and producer based in Seattle, Washington. She is celebrated for her extravagant costumes, bawdy humor, sizzling strip-tease, high glamour, and pulchritudinous performances. She has been a featured guest of the illustrious Teatro Zinzanni Seattle and Teatro Zinzanni San Francisco. Miss Pearl travels widely to perform and teach and has headlined as close to home as Portland, Oregon, and as far away as Paris, France.